Some people say that the heat during the summer dries out their lips, others say that the cold harsh winter makes their lips dry.. For me, it’s a never-ending journey of chapped, peeling, dehydrated, flaking, dry and sore lips. I was literally born with chapped lips! I’m constantly looking for the perfect lip products. I have always swayed towards Carmex but I find the smell goes back my throat and tickles it non stop when I use it- BUT it smooths out my lips really well. I’m on the hunt for the perfect lip products to use every day that will make my lips look their best and not have any negative effects! 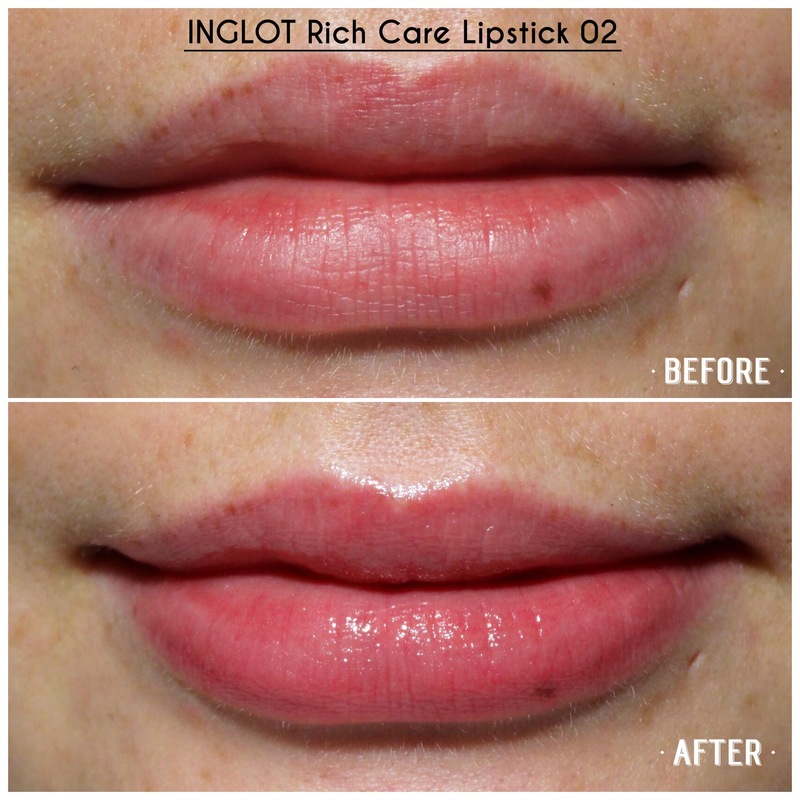 Why Use INGLOT’s Richcare Lipstick? I love Inglot because I feel with their products, so much thought goes into the composition of them. For those of you who don’t know very much about Inglot, It is a cosmetic brand created by a chemist; Mr. Wojtek Inglot! Knowing that a scientist has carefully crafted a product to give optimum care to my health gives me absolute confidence in the brand. 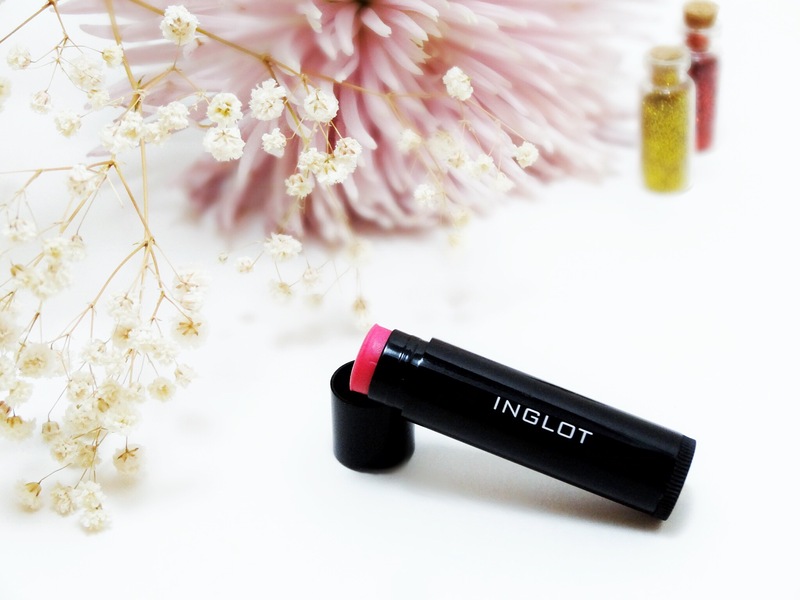 I was so grateful when the Rich Care Lipsticks were released by Inglot and I really couldn’t wait to try them! So now that we know that Inglot’s formulas are well thought out, lets look at the products ingredients in more detail..
01. is clear and does not provide a scent or a colour, only a light gloss. This one is hypoallergenic which means you will be less likely to get an allergic reaction if you tend to be sensitive. 03. is peach in colour and it contains SPF30. This one is not available in Canada but many other countries can stock it so check out your local INGLOT store or look it up online in your country. I’m gutted I can’t try this one! 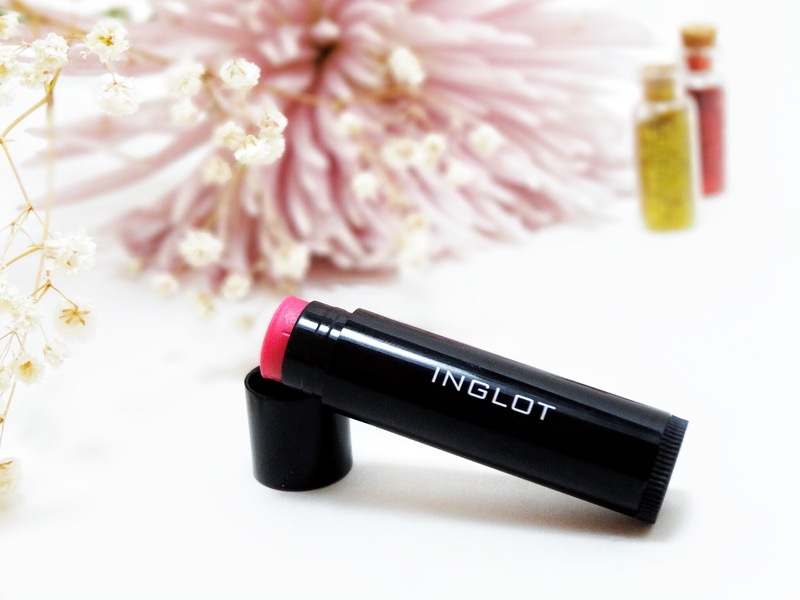 When I heard Inglot were releasing a new ‘lip treatment’ type product I was so excited to try it! I picked shade 02 so I could have the option to wear it on its own for a slight hint of colour or underneath to create a smooth canvas for my lippie. The packaging is very simple where you twist the bottom to raise and lower the product. I feel the packaging could be worked on in the Inglot Labs to make it look slightly more luxurious as it’s not an average chap-stick. But I also like Inglot for simplistic packaging (mostly black, with white logo) so I respect the company for keeping within that theme in mind. Upon first application I could feel the rich texture and moisturising benefits immediately. There is a slight smell with 02 that is very pleasant and it doesn’t tickle my throat what-so-ever! I felt the lipstick is very moisturising and it healed my chapped lips and left me with smooth lips. Reapplication is needed after 3-4 hours. The colour is very sheer but I liked it best on my no make-up days to add a bit of somethin’ to my complexion. I’m glad Inglot released three different types of Rich Care Lipstick as there is one for everyone’s needs. In conclusion, I recommend buying this product! Definitely give it a go, especially if you suffer from chapped and dry lips during any season! Even if you don’t suffer, they add a lovely light gloss, a hint of colour and are ideal to apply as a lip primer, especially before more dryer lip products i.e. matte lipsticks or liquid lipsticks. I got mine in Inglot Toronto for $12 but check your local store for details. I hope you enjoyed this post. I genuinely enjoyed writing it as it forced me to research the ingredients and learn more and more about the product! Let me know if you have tried Inglot’s new Rich Care Lipstick, I’d love to hear what you think! Many more reviews of Inglot products on the way ;)! !